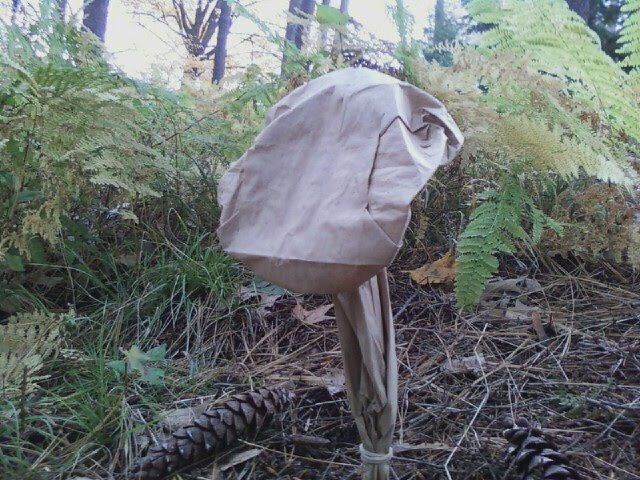 Okay, so I finally solved the Mystery of the Paper ‘Shrooms. As you may remember, I was dying to know the origin of these mock mushrooms that were popping up along the walkway between Massey Hall to the main part of campus (a.k.a., the Magical Forest). Well, not long after my frustrated post, I received an e-mail from Channing Frampton, a junior media arts major at RMU, with a concentration in TV/video and a minor in theatre. According to Frampton, he and his classmates created these particular paper fungi as part of an installation art project for his humanities class taught by Barbara Burgess-Lefebvre, M.F.A., assistant professor of communications here at RMU. The first time he saw paper mushrooms along the pathway, Frampton, like me, was curious about their origin. Once he signed up for the humanities class, he learned that this particular medium and subject was chosen because it added to the “magical wonder” of this scenic part of the RMU campus. And being that they’re made of paper, the mushrooms were a great choice for Prof. Lefebvre, who teaches her students to be environmentally conscious. “I want my humanities students to have hands-on experiences with art – not to just learn about them,” says Lefebvre, who wanted a project that could be accomplished in one class, that didn’t require any particular artistic experience, and that they could do together. “We talk about installation art and performance art in class and then tackle the mushroom project,” she says. “Even the students who are dubious about their mushroom can see the effect that everyone’s work has together. So there you have it. Mystery solved. And you probably thought that the paper mushrooms were put there by mischievous little gnomes who live high in the towering pines of the Magical Forest. Ha! How silly of you! Everyone knows that the gnomes live underground. Okay, I thought I could live with the mystery and the romance of not knowing. WHAT’S THE DEAL WITH THE ‘SHROOMS?!?! Two years ago, when I first came to RMU, I was walking through the Magical Forest, i.e., the scenic pathway from Massey Hall to the main part of campus, when I noticed some very large mushrooms growing at the base of one of the tall pines. 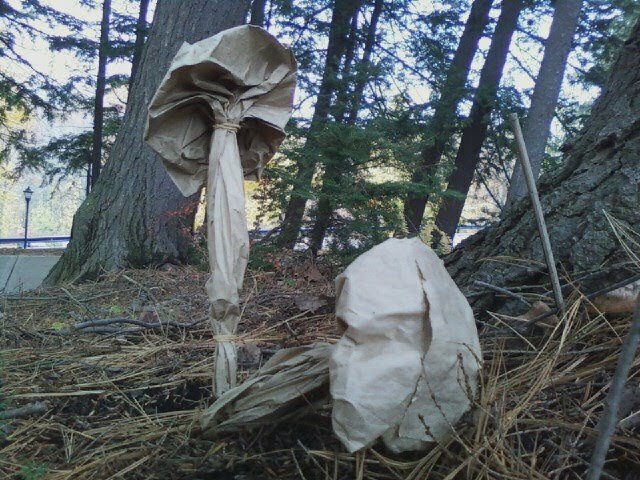 Upon further inspection, I realized that these very realistic fungi were actually made of paper. Who would make paper mushrooms? Why would they “plant” them along this secluded pathway? Would they taste good on a hamburger with Swiss? It was certainly perplexing, but not enough for me to actually do anything about it. Then it happened again this year. Now I absolutely must know. 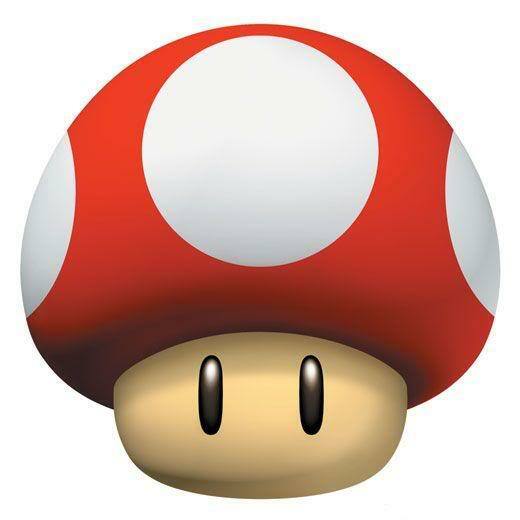 So in the coming days I will be launching an investigation into the Mystery of the Paper ‘Shrooms. 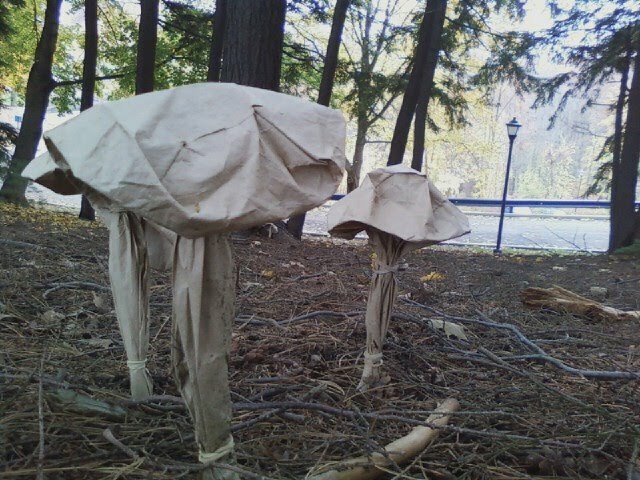 If anyone out there knows anything about the origin or meaning of these imitation toadstools, drop me a line at brkich@rmu.edu. Just as this was happening, I heard a similar cry coming from behind me. I turned and looked high up into another tree to see three smaller hawks perched on a lofty branch. These must be her babies, I surmised. At that moment, I was quite happy that I was a man and not a mouse or a chipmunk. Surprisingly, it was the first time I’ve ever had such a thought. Baby Hawk #1: Hey look…there’s that guy again. Baby Hawk #2: Oh, yeah—the one that looks like Brooks Orpik. And look…I think he’s checkin’ us out. Baby Hawk #3: Doesn’t he have anything better to do? HEY! Why don’t you take a picture, buddy? It’ll last longer! Mama Hawk: That’s enough. Just ignore him and he’ll go away. Baby Hawk #2: Hey…I bet you can’t…you know…hit him from here. Baby Hawk #1: I bet I can! Baby Hawk #3: Oh, I definitely want some of this action. Mama Hawk: That’s enough! Nobody is going to be hitting anyone. Got it? Don’t forget the last time you tried to “hit” someone and almost got Pres. Dell’Omo instead. Baby Hawk #1: Hey, what’s goin’ on over there? See all those construction vehicles? 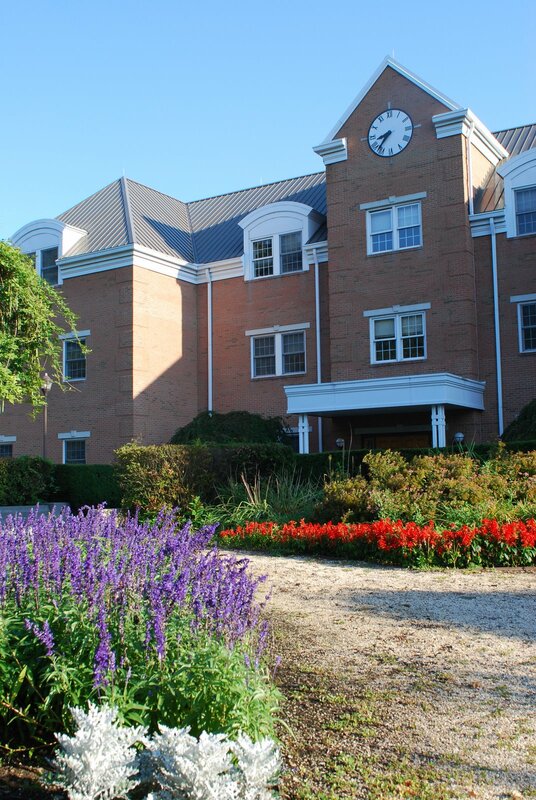 Baby Hawk #3: They’re renovating some of the dorms and putting in some new sidewalks. It’s part of the first phase of the university’s Master Plan. Baby Hawk #2: Master Plan? What you know about any Master Plan? Baby Hawk #1: Yeah, you can’t even read. Baby Hawk #3: Groundhog told me about it. Baby Hawks #1 and #2: Oh. Baby Hawk #1: By the way, where have all the students been lately? Baby Hawk #3: It’s summertime, dummy. They won’t be back until orientation on August 20. Baby Hawk #1: Oh, that’s right. I wish RMU offered classes for hawks. I always wanted to get into nursing. Baby Hawk #3: Yeah right, and I always wanted to get my MBA. Gimmie a break. Baby Hawk #2: Hey look…that guy’s leaving. Guess he got tired of staring at us. Let’s buzz him and give him a real scare! Mama Hawk: Nobody’s going to buzz anyone. They don’t bother us, we don’t bother them. Baby Hawk #1: Aw, com’on Ma! Mama Hawk: You heard me. Now keep your eyes peeled for lunch. They don’t allow hawks in the Food Court, you know. I still remember the first time I saw those towering pines standing guard just outside Massey Hall. 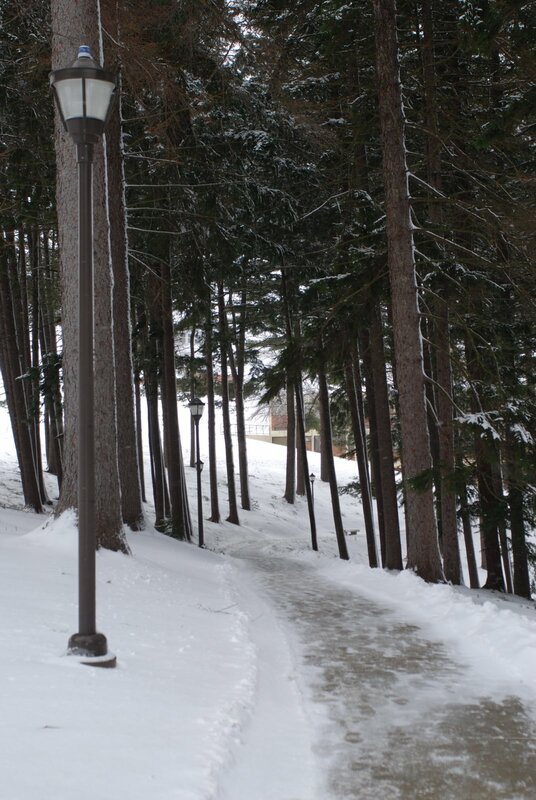 It was a cold day in January and it was my first time ever on the RMU campus. A thin layer of snow blanket the ground and built small drifts on the sidewalk as the winter wind whipped through the trees. And that sound—you know, the whooshing sound the wind makes as it pushes through a pine tree—it made me feel like I was a thousand miles away out in the wilderness, rather than just 15 minutes from Pittsburgh. There was a lamppost there, too, within the trees, and it got me to thinking. At that moment, if a half-human, half-goat would have emerged from behind the trees, I could’ve been in Narnia rather than Moon Township. Then again, if a half-human, half-goat had emerged from behind the trees, I would’ve screamed and ran away and never come back to RMU again. Luckily that didn’t happen. If you’ve ever been to Robert Morris University, you probably know what trees I’m talking about. Covering an area that stretches from Massey Hall almost all the way over to Nicholson Center, these majestic giants create a miniature forest, if you will, and make up one of the more unique and peaceful spots on campus. And there’s even a cement pathway running right through the middle of them, providing a delightful trek in an enchanted setting. I’ve even heard people refer to these trees as the “Magical Forest,” and it’s easy to see why. Being a writer, I’m not really a numbers guy. Heck, I need my wife’s help just to figure out how much to tip when we go out for dinner. But ever since I first saw these huge pine trees, I was curious to know just how many there were. So, one day I went out and counted them, not once but three times. And of course, I came up with three different numbers. But let’s just say there’s around 200 of these trees out there (at least, there were before three of them blew down in a windstorm last fall). I was also curious to find out just what type of trees these were and approximately how old they might be. So I consulted RMU’s Department of Science and its resident tree expert William J. Dress, Ph.D. Dress, the department head and assistant professor of science, told me there’s a few different types of pines in this grouping. “There are several white pine and hemlock,” he says, “but there are probably at least one or two more types as well.” As for the age of the trees, he couldn’t be sure without cutting one down and counting the rings, which would be somewhat contrary to the point of my inquiry. But he estimates that most of them are at least 50 years old. 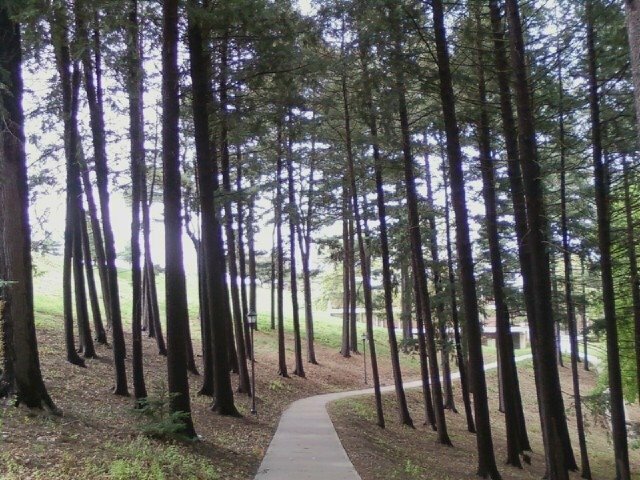 If you’ve never gotten a chance to walk through RMU’s “Magical Forest,” I urge you to do so. 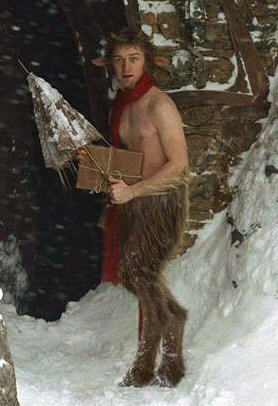 Just be on the lookout for any half-human, half-goat creatures. I’m still not convinced.